97'' Big Bore Kits for 1999–'06 Big Twins FREE SHIPPING! 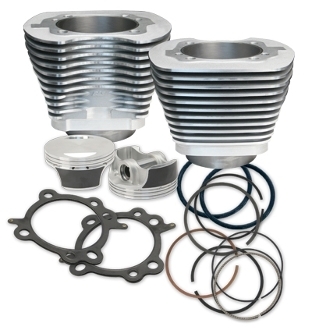 Our Products >> 97'' Big Bore Kits for 1999–'06 Big Twins FREE SHIPPING! With no need to rebalance flywheels, bore crankcases, or bore cylinders, this kit is about as easy as it gets. Consisting of the largest bore we feel can safely be used in a cylinder with a stock spigot diameter, this kit brings a new definition to the term 'big bore'. Largest bore we feel can safely be used in a cylinder with a stock spigot O.D.